Words are very delicate because their impact can be either positive or negative. Words can also reflect your personality. I have learned that words are the greatest assets you have. I remember when we were moving houses, mostly because it meant that I had to go to another school. I was so worried about my friends and how to settle into the new school. My dad told me it was going to be alright. I came to the new school and felt I was not loved. The way I was approached by teachers and other students left me with a negative impact. Maybe people did not understand me, so I always felt bad going to school. This went on for awhile but overtime it got better. I began meeting other people in school who approached me with kind words and this brought back my self confidence. An opportunity came when we held a contest for student ambassador. I had to give a speech about why I felt I should be voted student ambassador. So, I put my speech together and told them how responsible I was and everything I was willing to do to move all students forward. 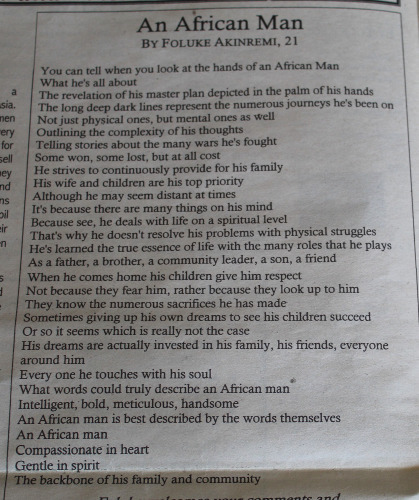 I expressed myself through words and received so much encouragement and kind words from some of the students. Words are powerful; they should be used wisely and with caution. I became the student ambassador because I was able to use my words well. 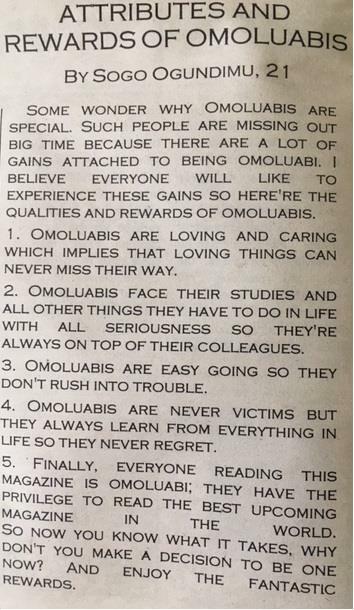 Words reflect Omoluabi. I speak responsibly as an Omoluabi, I speak with care and caution. I represent OMOLUABI!